The following is a list of officially-licensed Sonic-themed clothing. 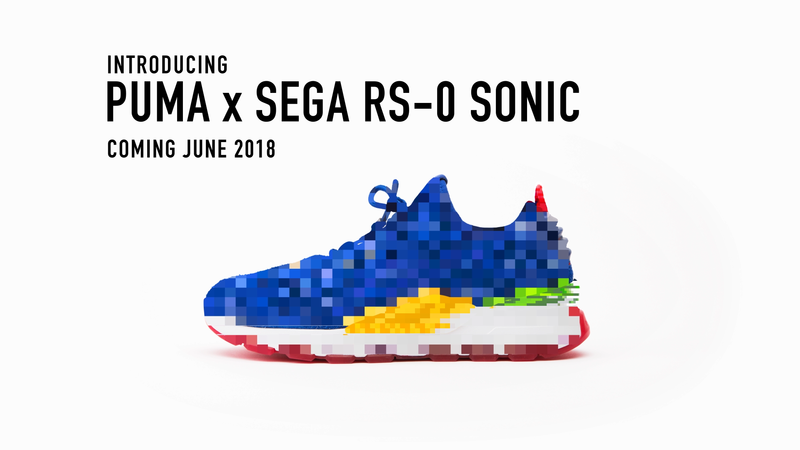 Shoes 2018-06Media:RS-0 SONIC-Still-1920x1080 00752.png US$130/£116/€130 Puma "Puma x Sega"Media:PumaxSega logo.jpg collaboration, consisting of two pairs of training shoes: The Puma RS-0 Sonic (blue with Green Hill Zone highlights) and Puma RS-0 Dr. Eggman (red with Scrap Brain Zone highlights). Both were released on 5 June 2018 in Europe and 12 June 2018 in the US. The shoes come in a box decorated with Green Hill Zone graphics. Pajamas 2014-02-05 SGI Apparel Boys' t-shirt/pajama set, sold on Amazon.com. Available in sizes 6-7. Shoes 2018 ¥8,640 Sou-Sou Jika-tabi (outdoor toed) shoes, sold on the Sou-Sou website. Socks 2018 ¥594 Sou-Sou Tabi (toed) socks, sold on the Sou-Sou website. T-shirt 2018 Primark T-shirt sold in Primark stores. Hoodie 2018 Primark Hoodie sold in Primark stores. T-shirt 2018-03 €8 Primark T-shirt sold in Primark stores. T-shirt 1994 Ecoplay Prisvideo Promotional t-shirt for the Sonic Contra-Ataca VHS cassette (the text reads Sonic Contra-Ataca, o meu filme... which translates for Sonic strikes back, my movie, or implied as my kind of movie...). Manufactured by Alhos Vedros-based Portuguese advertising objects manufacturing company Plural - Produção, Importação e Exportação de Objectos Publicitários, Lda. at Prisvideo's request. Tracksuit 1994 A. W. Stam, Lda A children's training suit with artwork for Sonic Chaos. Manufactured by now defunct Oporto-based, Portuguese raw cotton importer and clothing manufacturing company Algodoeira W. Stam, Lda (founded in 1937). T-shirt 2018 Primark Men's t-shirt sold in Primark stores. T-shirt 2018 £6.00 Primark; Poetic Brands Men's t-shirt sold in Primark stores. Available in sizes XS-XXL. Socks 2018 Primark Men's socks sold in Primark stores. Available in sizes 6-8 and 9-12. T-shirt 2018 Primark; Cedarwood State T-shirt sold in Primark stores. Also available as a vest. T-shirt 2017-09-05 £4.50 Primark T-shirt sold in Primark stores, for ages 2-7. Socks 201x £6.00 Asda Socks sold in Asda stores and online in packs of four, fits UK sizes 6-12. Jumper 2016-10-10 Numskull Jumper sold on Amazon, available in 7 sizes. Jumper 2016-10-07 Numskull Jumper sold on Amazon, available in sizes XS, S, M, L, XL, 2XL, 3XL, 4XL. Also given away as a prize on SEGAbits. Socks 2014-10-14 Numskull Socks sold in Tesco and on Amazon in packs of three (Sonic, Dr. Eggman and Green Hill Zone patterns), fits UK sizes 6-11 (EU 39-46). Pajamas 201x Primark Pajama bottoms sold in Primark stores, described as "Mens Lounge Pant". Pajamas 2010 Primark Pajama bottoms sold in Primark stores, described as "Lounge Pant". T-shirt 1993-02 £10.99-£14.99 Sonic Offers/Home Entertainment T-shirts sold by "Sonic Offers" or "Home Entertainment" through a P.O. box between February and May 1993. Came in 5 varieties - three at £10.99 and two at £14.99. This page was last edited on 5 March 2019, at 22:18.